It’s the third largest cause of death behind heart disease and cancer. It’s a leading cause of serious, long-term disability in the United States. And on the average, it will cost individuals $140,048 in their lifetime for necessary care of lasting deficits. and physical consequences for the rest of their lives. As a result of the debilitating nature of their stroke, many survivors can develop other medical sequelae including: diabetes, cardiovascular disorders, pneumonia, seizures, and even fractures from falls. And each year, approximately 795,000 of these stroke survivors will suffer a new or recurrent stroke, which only adds to their disability. stroke2), risk factors must be managed appropriately to prevent the cycle of further physical impairment and subsequent disability. One of the key ways to decrease risk factors such as hypertension, diabetes, and high cholesterol is with physical activity. What Happens In Neuro Rehab? The motor deficits in stroke patients are usually classified as hemiplegia (paralysis) or hemiparesis (weakness). And with poor volitional movement accompanied by significant weakness, what do most PT’s do? They strengthen those weak muscles. Progressive Resistance Exercises (PRE’s), Proprioceptive Neuromuscular Facilitation (PNF), and electrical stimulation can be used to try and assist in the process. muscles, so that is where the major retraining needs to occur. Working on isolated muscle groups will not be fruitful if the damaged brain is not able to reorganize and reeducate itself to send signals to the muscles that need to move. Since brain damage cannot be reversed, true “healing” in the musculoskeletal sense does not occur with brain injuries. Instead, what we are looking at is a “rewiring” of the motor and sensory cortices of the brain to help the body relearn movement. This is the core of what much of neurological rehabilitation is based upon. In motor learning theory, the assumption is that patients can improve with practice. By practicing task specific and goal-oriented activities, scientists and researchers hypothesize that patients can possibly encourage cortical change through volitional movement. This brain plasticity, ability to change and adapt, is what ultimately leads to “healing” in neurologic patients. because it is not used or avoided. With CIMT, the goal is to force use of the involved limb. With the upper extremity, this is achieved by placing the unaffected limb inside a sling for 90% of waking hours over 2 weeks. The affected limb is then used repeatedly for 6-7 hours per day over these 2 weeks in a variety of different exercises and activities. By forcing use of the affected limb, there may be a functional reorganization in the undamaged motor cortex, possibly resulting in improved motor ability.3 Some alterations CIMT has been shown to produce include changes in brain metabolism, blood flow, and electrical excitability.4 Because change can be elicited, there is possibility that the irreversible damage caused by infarcts can be limited by these neuroplastic responses. 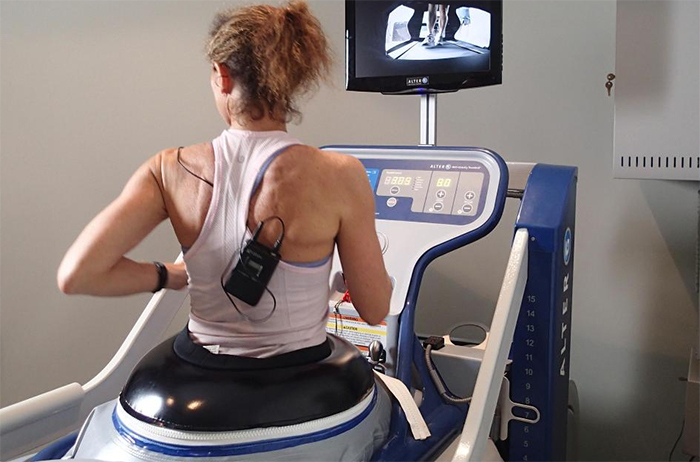 In neurological rehabilitation of the lower extremities, one way to force use and encourage practice is through Body Weight Supported Treadmill Training (BWSTT). Treadmills themselves are popular because of the ability to combine active repetition, task- specificity, and proprioceptive training with aerobic exercise. The ability to encourage improvements in ambulation, coupled with increased cardiovascular fitness, is important for this group because of the potential positive impact on function as well as the other medical issues these patients may have. In a study performed by Harris-Love et al (2001), they looked at the gait patterns of 18 chronic hemiparetic stroke victims overground and on a treadmill. Hemiparetic gait is usually variable in stride-cycle characteristics due to sensory and motor deficits of the patients. In their study, these researchers collected results that demonstrated that treadmill walking produced an improvement, resulting in a more consistent and symmetric gait. In another study by Luft AR et al (2008), a randomized controlled trial with 71 stroke patients looked at a treadmill exercise group versus a control (stretching) group, to see if task- repetitive treadmill training could improve gait and fitness. Not only did they see improved ambulation in these stroke patients, these investigators were able to show through functional MRI, that cerebellum-midbrain circuits.